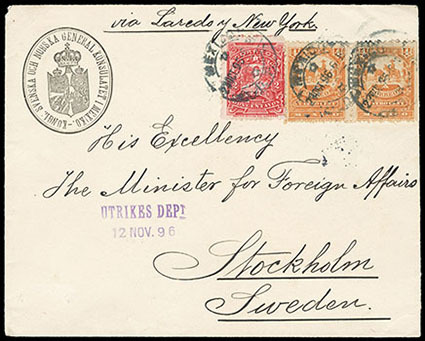 Mexico, 1895, 2c carmine, in combination with 1895, 4c orange pair on Swedish Consulate in Mexico corner card cover to Stockholm, Sweden, appropriate transit and receiving backstamps, Very Fine. Scott No. 243+224 Estimate $150 - 200. 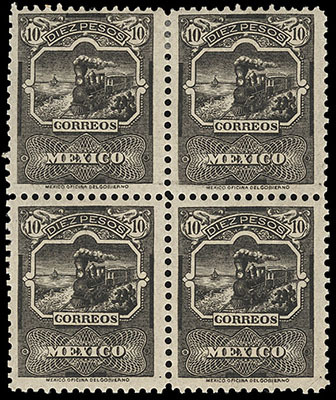 Mexico, 1895, 10p Mulitas Issue, black presentation proof, "Correos EUM" watermark, block of 4, full slightly brownish o.g., Very Fine, very rare in multiple format, originally intended for UPU but rejected as they were not in the issued colors. Scott No. 256P Estimate $300 - 400. 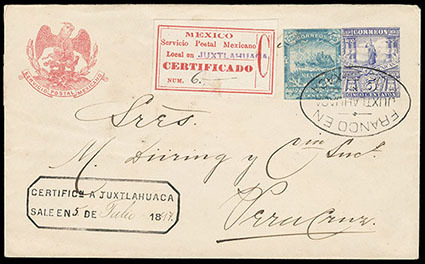 Mexico, 1896, 15c bright blue, cut to shape, on 5c Mulitas registered entire to Veracruz, tied by Juxtlahuaca oval handstamp with matching 1897 boxed certification date stamp and registry etiquette, reverse with receiving handstamp and signed, Very Fine, a rare usage from this tiny town. Scott No. 263 Estimate $150 - 200. 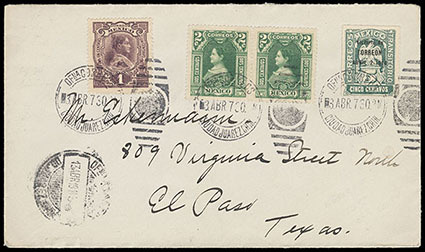 Mexico, 1914, 5c Victoria de Torreon, with 1910, 1c + 2c pair Centenary issues on 1914 cover to El Paso, Tex., all tied by Ciudad Juarez duplex postmarks, Very Fine. Scott No. 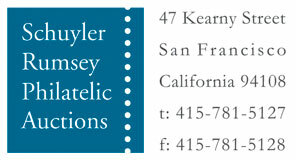 365+310-311 Estimate $200 - 300. 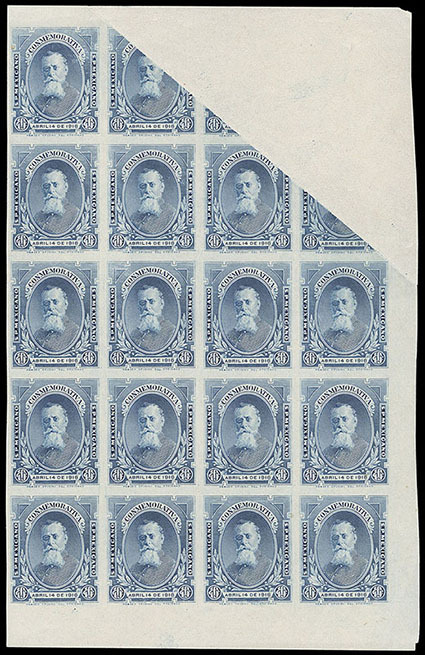 Mexico, 1914, Sonora, 20c orange and blue, complete tête-bêche sheet of 40, couple tiny insignificant pinholes as usual, without gum as issued, fresh and Very Fine, scarce (no photo). Scott No. 399 $600 for singles. 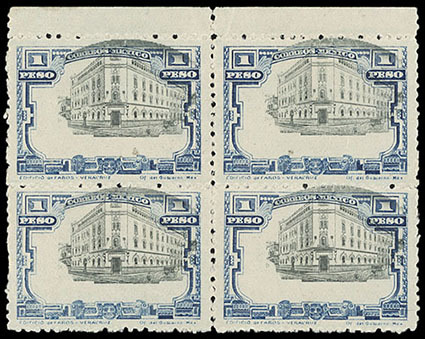 Mexico, 1916, 10c blue, imperf, block of 20, without gum, with dramatic fold over omitted all or portions of the 5 top right stamps, Very Fine; signed J. Bash. Scott No. 574a Estimate $150 - 200. Mexico, 1917, 1p blue & black, with vignette of 5p, top margin block of 4, o.g., right stamps never hinged, wide margins, bright and fresh, minor short perfs and separation, still Very Fine, a very rare multiple; with 2011 M.E.P.S.I. certificate. Scott No. 627a $3,600 for hinged singles. 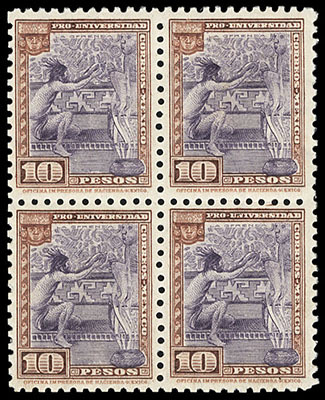 Mexico, 1934, 5c-10p National University complete, blocks of 4, o.g., bottom stamps never hinged (10p with small gum skips on bottom stamps and large skips at top), fresh with rich colors, a Very Fine set, a scarce multiple set. Scott No. 698-706, RA13B $21,860 for singles. 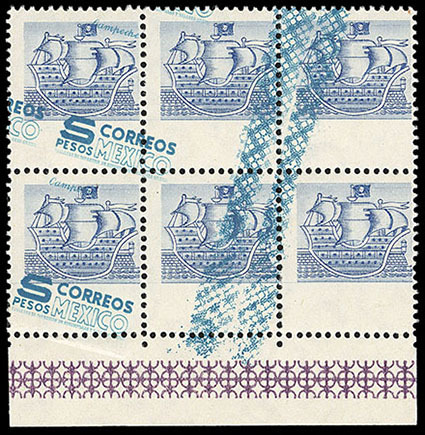 Mexico, 1950, 5p Galleon, top right corner margin block of 4 and top left corner margin pair, showing dramatic shift of value tablet with marginal imprint across four stamps in block, pair showing value tablets in selvage, glazed o.g., Very Fine, a unique modern error, only one sheet recorded. Scott No. 865 var. Estimate $250 - 350. 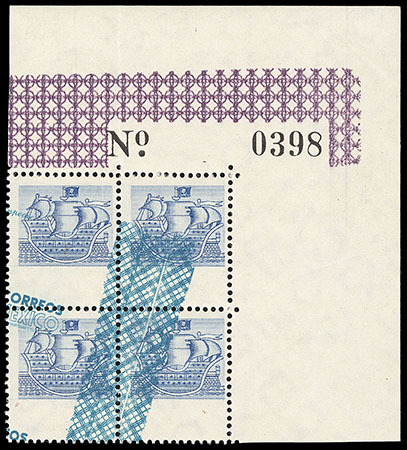 Mexico, 1950, 5p Galleon, bottom margin block of 6, showing dramatic shift of value tablet with marginal imprint across four stamps, glazed o.g., Very Fine, a unique modern error, only one sheet recorded.